I wrote a post a while back about how pumped I was to see Newport Market representing the Alesmith beers. If you, dear reader, haven’t yet picked up, at the very least, a Speedway Stout, frankly I’m disappointed in you. Now go clean your room. Seriously these guys are a cut above the rest. Yes, it’s expensive at one bottle for $12.00. But believe it or not, that’s a pretty good deal, and as Jimmy from South Park would say to the Crips and Bloods, “Come on”. $12.00 is really no excuse for robbing yourself of a uniquely fantastic beer-drinking experience. This tasting is for one of their beers that I hadn’t tried before, so without further ado … the Grand Cru (insert poet/know it thought here). Appearance: Deep amber. Tan, inch-high head that settles into a quarter-inch layer that stays for about a quarter of the glass. Smell: Wow malt! Big malt and spices. Some yeast-ester aromas in there as well, but it’s toying with me … not clear as to what I’m picking up there. Intriguing! Taste: My palette just got slapped in the face! 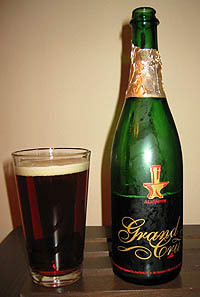 Rich caramel malt flavors with ripe dark fruits of plumb and raisin. Hints of chocolate in the finish. It just keeps giving. Can taste that classic Belgian candi sugar flavor as well butting up against the yeast. Warming, moderate alcohol heat is supported by the huge malt backbone. Smooth. Mouthfeel: Rich with solid carbonation despite the 10% alcohol sweetness. Drinkability: This is a big, boozy beer. No kidding. I spent a good amount of time with the one glass in the picture, and definitely wanted to share it with my wife. Excellent beer. Probably will buy another, and set it aside for a while to see how it cellars. If you’re into big Grand Cru beers, definitely check this out.